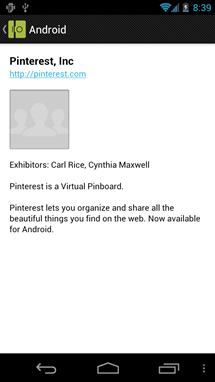 Pinterest will be available in Android soon. Pinterest is reportedly coming to Android soon. Australia’s Eagle eyed gadget site, Austroid recognized that among the list of exhibitors Pinterest Inc. is on the list of official Google I/O app. This app is already made available in the market for Android. This listing is directed at Explore > Android > Sandbox > Pinterest. So now customers can set their own personal confirmation. We still may not find this app in Google Play store but it is believed that in a recent Google’s Devstravaganza later this week we may get the confirmation. Now we have to wait and watch how the Pinterest can be fixed on the Android phone.